It is touted as being made of hemp, corn, and fiberglass. But without even looking at the Mad River Malecite ECO canoe, I knew there was something wrong with the boat: Namely, it’s not for sale. The South Carolina canoe maker decided to flex its “green” boat-making skills to create a super, Earth-friendly concept canoe made from mostly renewable resources. But it teases people with its existence. The concept canoe contains a layer of non-“green” fiberglass to make it stronger. There are a couple layers of hemp fabric to form the hull shape and provide more rigidity, according to the company. Another layer of fiberglass adds strength and prevents water absorption, and a low-VOC (volatile organic chemical), corn-based clear coat is a final touch. The Malecite ECO is based on the design of the Malecite, the original canoe that launched the Mad River brand 1971. It is a versatile, shallow-vee flat-bottom canoe. 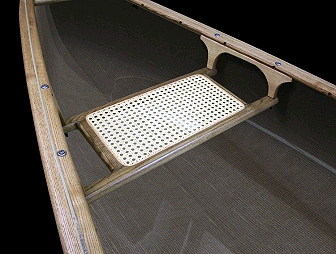 The concept canoe has ash gunwales, seat frames and trusses. There are beech wood decks, cane seat panels, and recyclable stainless steel fasteners.